Typhoon MA-ON keeps moving northward. 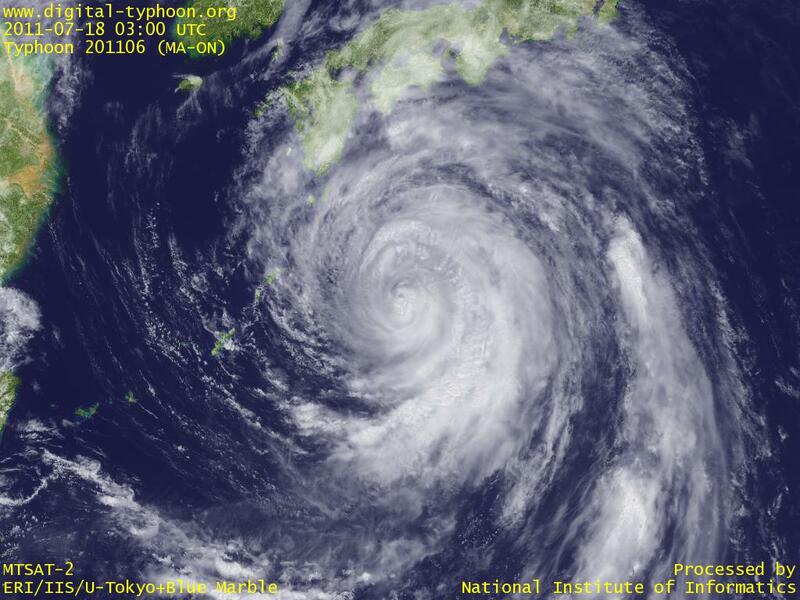 Because of the large size of the typhoon, it drew near to Japan with little weakening. Western Japan is already within the gale wind circle, and heavy rains were already observed along the coast of Pacific Ocean from Kyushu to Shikoku and Kii Peninsula. It is expected soon that the cloud system of the typhoon covers those areas, so please check the latest rainfall and accumulated rainfall from Japan Meterological Agency, or weather radar image and real-time AMeDAS rain maps. For your information, the latest typhoon location is also updated at Twitter @DigitalTyphoonE. Typhon MA-ON is approaching to Japan. Weather radar image shows that heavy rains already started in Kyushu and Shikoku. Moreover, "GPV Wind" of real-time AMeDAS Wind Map illustrates the distribution of wind around the typhoon. The track of the typhoon turned to north, so we need to watch the latest typhoon information to know how close the typhoon draws near Japan, where extensive areas may be affected by heavy rains, strong winds, and storm surges due the the large size of the typhoon. Typhoon MA-ON started intensification again. For a few days, its intensification has been slow due to the asymmetry of the cloud pattern, as I mentioned in the first entry that the cloud was biased toward south. But this situation is now getting solved, and we can see an eye at the center. It is not rare to see a typhoon that takes a few days to have a well-organized cloud pattern, and this was possible because the typhoon had enough time in the middle of Pacific Ocean. The typhoon started to have a northward movement, however, so the peak intensity will be reached soon. Ogasawara Islands are now having the water shortage problem, and this typhoon has been disappointing until now. AMeDAS Chichijima and AMeDAS Hahajima recorded only 2mm of rain for these 72 hours. But this typhoon is a large one, so it may bring rains after passing the islands. Typhoon MA-ON is intensifying near Minamitorishima Island. It seems that there is no factors to slow down the intensification, and the typhoon still has a plenty of time to intensify in the middle of Pacific Ocean. Hence it is necessary to be on alert refering to the latest typhoon information. The northern part of Mariana Islands will soon enter the gale wind circle, and Saipan may also be included in the gale wind circle at the time of closest distance. 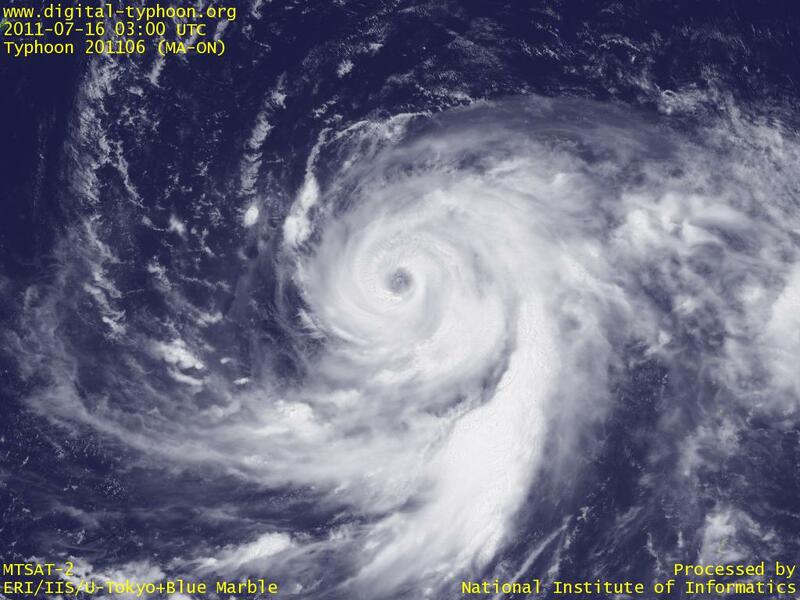 Typhoon MA-ON was formed near Minamitorishima Island. This is the first typhoon since 2009 being formed in this area. This typhoon is forecast to move slowly westward in the middle of the Pacific Ocean, which means it has plenty of time to intensify. We need to watch this typhoon. This typhoon is forecast to reach near Ogasawara Islands in two days. Ogasawara Islands were just recently added to the list of World Heritage Site (Natural Heritage) by UNESCO, but this area has a trouble these days, the shortage of water most severe in almost 30 years due to the smaller rainfall of this year. I wish this typhoon would give them a blessed rain, but at this moment the typhoon does not have well-developed rainy clouds in the north side, so if Ogasawara will have heavy rainfall to solve the water problem depends on the intensification of the typhoon in these two days.